In the previous episode of this series about how to develop a Windows Phone application from scratch we used the Isolated Storage Explorer Tool to take a look at the contents of the ApplicationSettings, stored in IsolatedStorage on the device or emulator. This time we continue dealing with our application settings, because we are going to talk about Fast Application Switching and Tombstoning. As you probably know, only one application can be running in the foreground on a Windows Phone. That application can use as much resources as it needs and should be as responsive as possible to give end users a great experience. Typically, users switch often between applications. They might not even think about different applications, because they are most likely very task oriented. To give end users the best experience, our applications share a responsibility with other applications and with the operating system. The user terminates our application by pressing the Back Key on the phone until the entire back stack of pages for our application is empty. Our application is interrupted because some sort of an event occurred. The first situation is simple. When our application is terminating, it is our responsibility to store information that we want to persist until the next time our application is running. This is what we did for EvenTiles in part 5 of the series, using the Application_Launching and Application_Closing methods that are defined in the App.xaml.cs file. NOTE: The description of Fast Application Switching and Tombstoning in this article is valid for Windows Phone Mango, not for previous versions of the operating system. The following picture shows our application running over time. The user navigated to the SettingsPage on EvenTiles, modified the string value and decided to use the Start Key on the phone to start another application. After a while, the user returns to our application by pressing the Back Key until our SettingsPage is visible again. For the user, this experience is great, because when they come back to our application, it shows up exactly as it was when they moved our application to the background. The operating system simply keeps our application in memory. There are some restrictions with regards to applications using certain resources like the camera. To keep our story lean and mean we will omit those. When the user starts many applications (thus putting more and more applications in the background), at some time the amount of available memory gets so low that another application can no longer be started. In this situation, the operating system decides to remove the oldest application in the background from memory, saving just minimal state information for that application. In this situation, the application that was just removed from memory is said to be Tombstoned. To restore our application from being tombstoned, we not only need to reload our application settings (as we did on the Application_Launching event), but most likely we also need to restore additional data. The Operating System ‘remembers’ the page in our application the user had visible when we were tombstoned. It is our responsibility to restore data that the user entered on that page (for instance the contents of a Textbox). The application will become the foreground application again without having entered the tombstone state. In this situation the application can benefit from Fast Application Switching. The application got tombstoned, but it will become the foreground application after a while. In this situation the application must restore more state information. 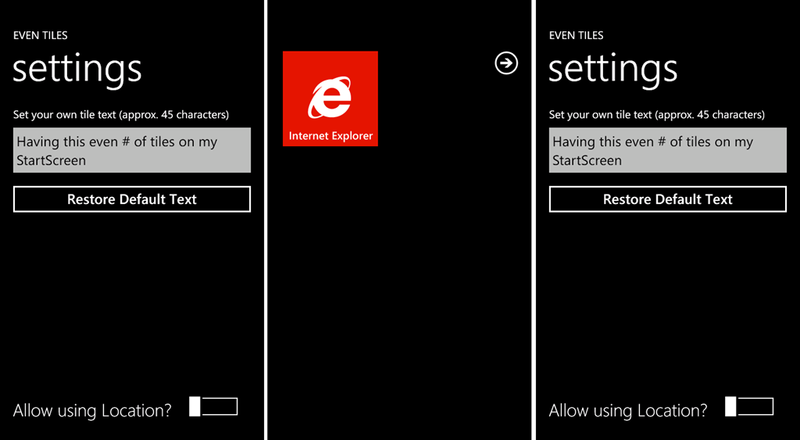 The user starts the application again by clicking its icon or tile on the start screen. In this situation, the previous instance of the application is removed and the user should see the application in its initial state. When you are debugging your application in Visual Studio, the default behavior when the application is moved to the background is for it to remain in memory. However, by modifying one of the project properties (as shown in the screen dump on the left), you can force the application to become tombstoned, regardless from the amount of free memory on the device (emulator). In this way, we as developers have the possibility to test our applications in either state they enter when being moved to the background. You should make sure that you test the tombstone scenario for your application. For instance, if EvenTiles with its current functionality is tested for tombstoning it will crash. This currently has to do with the way that data is initialized. In EvenTiles, we have a string property defined in App.xaml.cs that will later be used to write information to the back side of our Secondary Tile. The SettingsPage already makes use of this property. However, we are initializing this property, named ActualBackSecContent when the application is started in the Application_Launching method. Even though our application is removed from memory when it is tombstoned, if the user navigates through the back stack using the back key on the phone, eventually they will return back to a page of our application. In order to make this happen in case our application was tombstoned, it has to be reloaded again to memory to become active. In this situation, minimal state information was stored by the operating system (for instance which page was the last page the user saw when our application got tombstoned). On returning from tombstoning we will return to that page, but since the application needs to be started completely, classes have to be newly created and code in constructors of those classes will therefor be executed. To distinguish between starting a fresh copy of the application or returning from the background, Application_Launching (fresh restart) or Application_Activated (tombstoning or fast application switching) is called in our App.xaml.cs file. If our application was still in memory, there is no problem, after all, the property ActualSecBackContent still holds its value. If we are returning from a tombstoning situation we do have a problem, since Application_Activated will be called instead of Application_Launching. That is why the exception that is shown in the screen dump above was thrown. If the application is becoming the foreground application, we check if we were still available in memory. If so (e.IsApplicationInstancePreserved == true) we don’t do anything, otherwise we just initialize the ActualSecBackContent property. There is nothing else to do, because we know that a value with that particular Settings key already is available, since the application was launched at some time before Application_Activated was called. If an application is moved to the background you want to make sure to save everything in such a way that you assume that your application will never return to the background. After all, the application can stay in memory, it might be tombstoned but there is also a possibility that the user starts a brand new instance of the application from the start menu. In the latter case, the existing instance of the application in the background will be removed by the operating system. NOTE: If you are upgrading an existing application for Mango, at the very least (after converting your project in Visual Studio) you need to only retrieve stored data in the Application_Activated method when e.IsApplicationInstancePreserved is false. In that way your application will immediately benefit from fast application switching. With the changes that were described so far added to our application, it no longer crashes if we are returning from a tombstone state. There are however more things that need to be considered when the application is brought back from background to foreground. In the next Episode of EvenTiles we will take a look at restoring Focus on an input control when returning from the background. If you want to see EvenTiles already in action on your Windows Phone, you can install the latest release from Marketplace. Remember that this application is not meant to be extremely useful, although it contains similar functionality that “serious” applications have. All functionality that you can find in the released version of EvenTiles will be covered in the upcoming episodes of this blog series, together with all source code. Just go ahead and get your free copy of EvenTiles from Marketplace at this location: http://www.windowsphone.com/en-US/search?q=EvenTiles (or search on your phone for EvenTiles in the Marketplace application). As I promised a few days ago, in between other blog entries I will show you how to create a complete Windows Phone application from scratch. This project starts with running Visual Studio to create an initial solution and it stops after having updated the application a few times and successfully submitted each different version to MarketPlace. Initially I will focus on creating the application without thinking too much about testability and reusability. I just show you the possibilities of Visual Studio, the Emulator and later on Expression Blend, Marketplace and additional tools. Later in this project we shift focus towards creating a more maintainable application, also using modern design patterns like MVVM. This series of articles is not meant to be a complete programming course for Windows Phone. If you want to know more about developing applications in C#, you should take a look at the Rob Miles’ Yellow Book. Not only an excellent resource to learn the C# programming language but also fun to read. If you want to learn more about Windows Phone application development, I can highly recommend Rob Miles’ Blue Book, and Charles Petzold’s book titled Programming Windows Phone 7. The good news is that all these books can be downloaded for free and they are all very valuable resources. Ok, back to application development. In this first part, you will learn how to create the initial solution for your project, how to modify the default Application Tile, how to write something on the back of the Application Tile through the manifest file and how to modify the default Icon. You will also see the application in action for the first time. All steps that are necessary are not only documented, but also accompanied by a short video that can be viewed in this blog entry as well. If you already want to have a sneak preview of the application we are going to develop, it will be published on Marketplace soon. I will update this line with the link to the application once it has been certified. To begin with, we create a new Windows Phone Silverlight Application, call it EvenTiles and modify both the ApplicationIcon.png and the Background.png files to have a transparent icon for the application and a transparent Application Tile. The cool part about adding transparency is that the area’s of the art work that are transparent show up in the theme accent color that is selected by the user of the phone. Of course we are also setting the application name and a page name on the application’s main page. In order to clearly see the content on the back side of the Application Tile, it’s image is simply an entirely transparent image, meaning it will show a solid theme color as background of the back side content. Over the last week I have been writing about Live Tiles in Windows Phone Mango, how you can create Secondary Live Tiles and how you can display information on the back of Live Tiles and periodically change that information. There is more to write about Live Tiles, but I think it is time to change the topic slightly. In part 4 of the Live Tile mini series, I introduced an application that adds a Secondary Tile to the Start Screen of your phone. That application is now almost finished in its first version. This free application has a Secondary Tile, it contains an AdControl, deals with location awareness and periodically updates the Secondary Tile. It also can access Marketplace, both to submit a review for the application and to display other applications that are published by me. All in all it is a complete application, yet its functionality is very simple. It is simple enough to explain it almost entirely. That is exactly what I am planning to do over the upcoming weeks. Initially, the application makes use of code behind. In a later version it will be changed, making use of MVVM and Unit Testing. 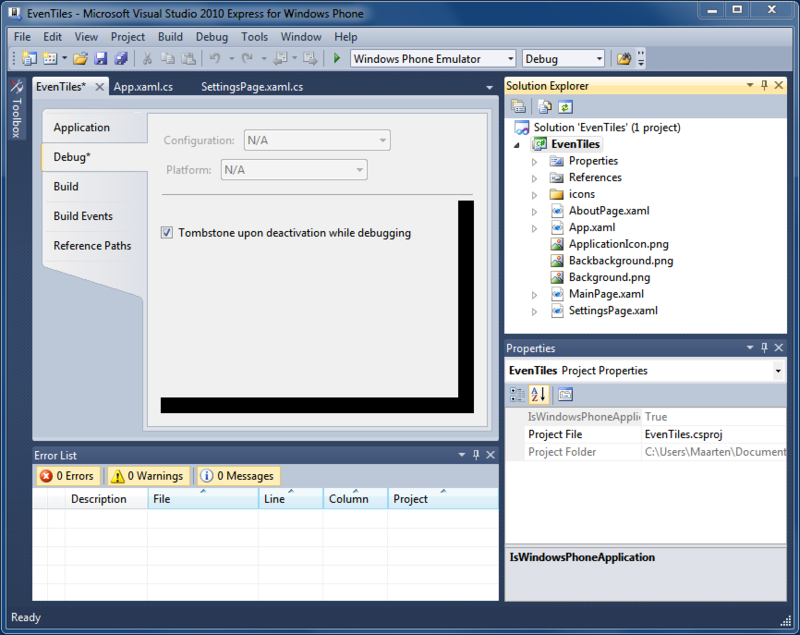 The application will also act as a sample to show profiling, debugging background agents and many more topics. I will combine blog entries and videos to show how to create this application, how to test it and hopefully how to publish it to Marketplace. As soon as the application is available for download, I will let you know in this blog entry. Here is a sneak preview of EvenTiles. This application is very simple, yet it contains lots of functionality that you can use inside a Windows Phone application. When the application is started, it checks if a Secondary Tile exists. Actually, it can even be started by clicking on its Secondary Tile when available. 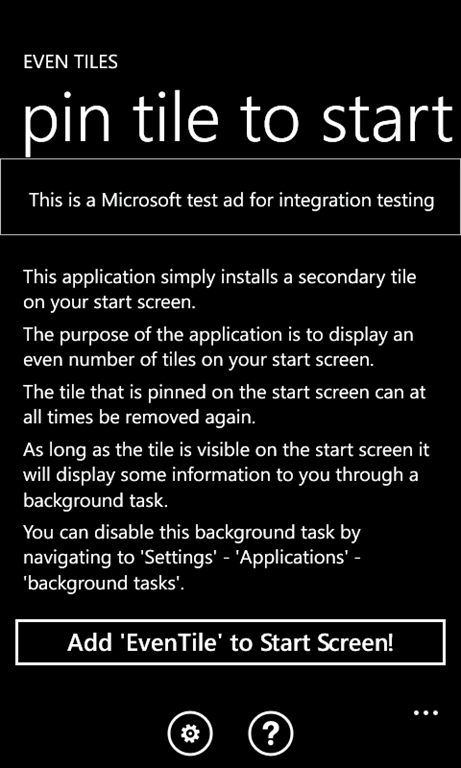 If no Secondary Tile is pinned to the start screen, the user has the option to create a Secondary Tile and automatically pin it to the Start Screen. When the Secondary Tile is already pinned on the Start Screen, the user has the possibility to remove it from the Start Screen. You can also see that the application has advertisements. In order to allow for localized advertisements, the application reads the current location of the device once (if the user allows doing that). The application has a Settings Page that can be reached through the ApplicationBar as well as an About Page. To preserve data, the application makes of of Isolated Storage. To transfer data between the application and its background agent, a file in IsolatedStorage is used that is protected by a Mutex. So even though the application itself is very simple, it contains many pieces of functionality that you can use in very complex applications as well. 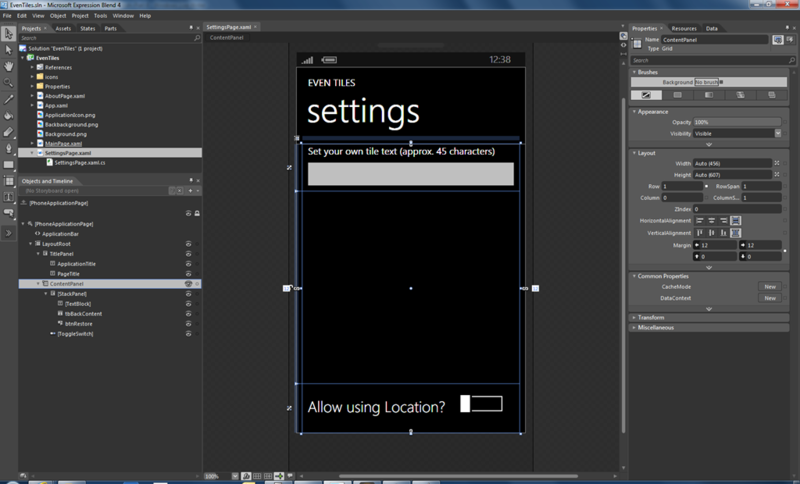 As such, this application is hopefully a starting point that allows you to develop fantastic Windows Phone Applications. Stay tuned for the first part of EvenTiles from Start to Finish – Part 1, which shows you how to create the initial solution and how to create a Secondary Live tile. Where did my ads go? Since a few weeks, Windows Phone developers can retrieve data on crash counts and stack traces for each published application through the App Hub. Because two of my applications indeed showed a few crash counts, it was of course time to fix the issues and to update the applications. One of those applications, ClickerLite, uses the AdControl to display advertisements inside the application. 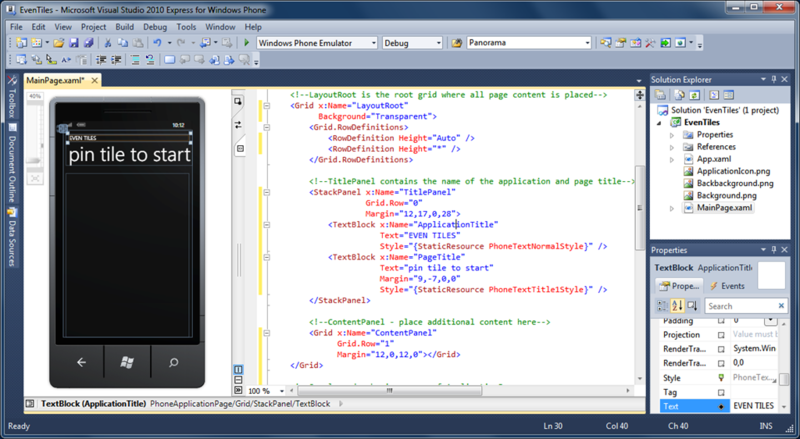 Besides fixing bugs, I also built the application against the latest version of the Windows Phone SDK. Instead of having to download and use a separate assembly to enable (Microsoft Advertising pubCenter) ads, the Microsoft Advertising SDK for Windows Phone is now part of the Windows Phone SDK. Of course this makes it easier to use the AdControl with full designer support in both Visual Studio 2010 and in Expression Blend 4.0. However, when I started to test my application, the AdControl was not visible, even though I did set the control up to receive test ads. As often, the solution to the problem was easy, although it took me some time to find it. I simply needed to add the ID_CAP_MEDIALIB capability to my application’s manifest file. In the previous version of the Advertising SDK, this capability was not required and therefore not included in the manifest file. 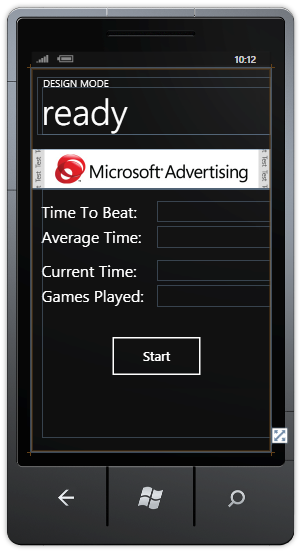 The end result was test advertisements showing up in the Visual Studio 2010 designer. However, when running the application (both in the emulator and on a real device), the test advertisements did not show up. This of course was also a clear indication that real advertisements would not show up in a released version of the application. Adding ID_CAP_MEDIALIB solved the problem, the test ad showed up during testing, and the application was ready to be updated. On a side note, if you are curious about ClickerLite, you can find it here on the Windows Phone 7 Marketplace. Note: This link will work from a Windows Phone 7, or from a PC with Zune software installed. A new Windows Phone 7 Device (Emulator)? Just a few hours ago, the Windows Phone Developer Tools Update was released by Microsoft. This update is specifically for Windows Phone application developers to allow them to build apps that are ready for the upcoming Windows Phone OS update. After installation of the tools update, you can test copy and paste functionality on the (also updated) emulator. In order to start working with the updated tools, you will need to download the Windows Phone Developer Tool update and a separate Visual Studio 2010 update. Also make sure to read the Release Notes for the update. The order of installation for the separate tools is not important but you have to install them both. A little more background information about the latest WPDT update can be found on the Windows Phone Developer Blog. It is expected that all existing apps that are already published in Marketplace will continue to work, both on phones that will be updated to the new version of the OS that will be available later, but also on phones that are not updated. To show the new copy and paste feature of Windows Phone 7 in action I have created a small application that takes a URL and allows that URL to be copied in Internet Explorer on the Windows Phone Emulator. To see this little application in action, just take a look at this video. Windows Phone 7 Copy and Paste with the WPDT January Update. In the above code snippet, a new instance of a BackgroundWorker is created and two event handlers are assigned to respectively the DoWork event and the RunWorkerCompleted event. Finally, the RunWorkerAsync method is called, which in turn fires the DoWork event on the BackgroundWorker, allowing the event handler to execute on a separate thread. 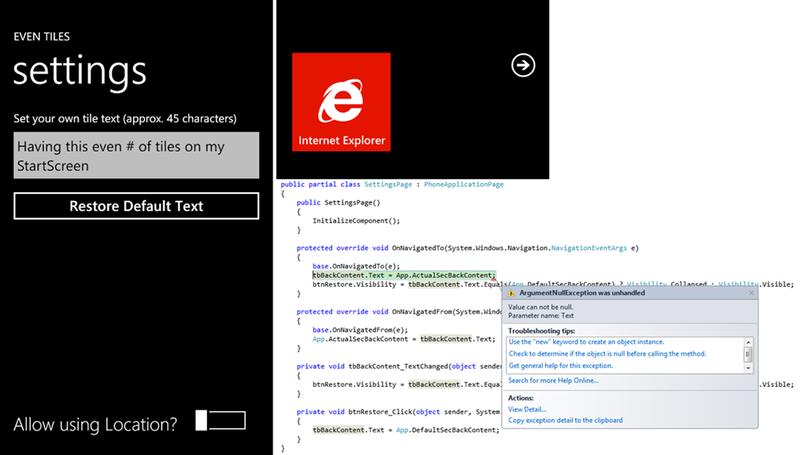 You have to be careful not to update UI Elements inside the DoWork event hander. It is only allowed to update UI Elements on the thread that created them (typically the UI Thread). In this sample this is no problem since the BackgroundWorker is only used to load sounds into memory. If you need to update UI Elements on a separate thread you must make use of the BeginInvoke method of the Dispatcher class. The BackgroundWorker has more functionality, for instance to report progress for long lasting operations. Progress information can be easily displayed to the user. In the above shown example, progress information is not used. The end result of using a BackgroundWorker is that the user interface remains responsive. In this particular example, the application starts pretty fast so that end-users can start playing while sounds are still being loaded. If you are curious about this game, you can find it Clicker here on the Windows Phone 7 Marketplace. Note: This link will work from a Windows Phone 7, or from a PC with Zune software installed. The game has a trial mode so you can try it for free.